It will just never cease to amaze me. Last year’s potato skins and celery butts are this year’s COMPOST! I started the compost bins last August, shortly after moving into the new apartment. You can read about how I made them here. 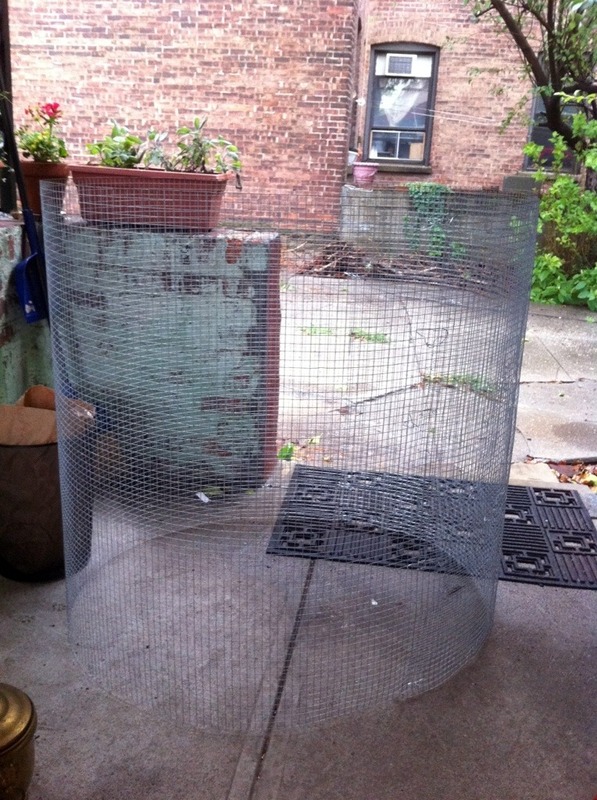 I made two bins – one with hardware cloth (above) and one with a wider-meshed “garden fencing” wire, both of which I picked up at Home Depot. 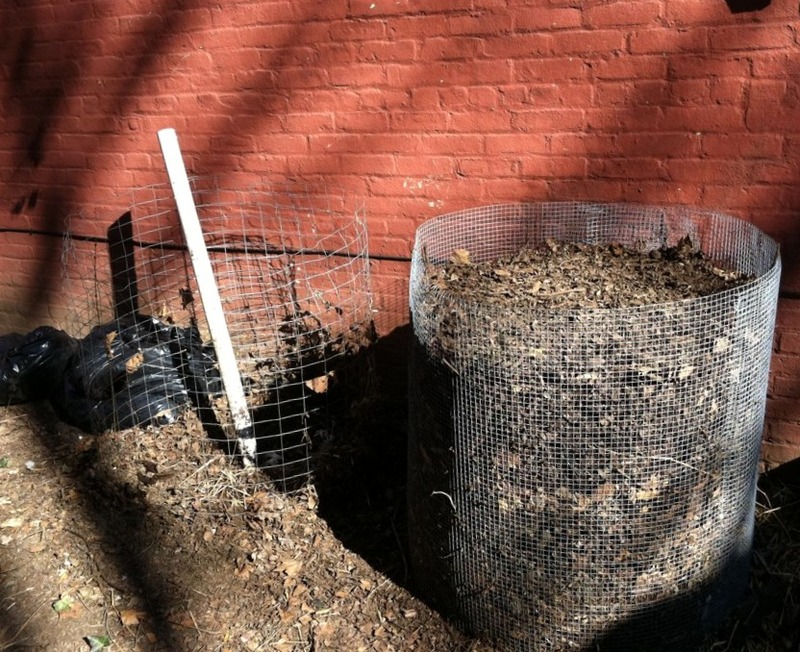 We used one bin for storing the FREE MULCH we got from Greenwood Cemetery and eventually added dried leaves to this bin as well in the fall. Our produce scraps and eggshells went into the other bin, layered with wood chips / dried leaves as needed. The PVC pipe was eventually held upright in the middle as we dumped and layered material into the bin. It has many holes drilled up and down it, on all sides, in hopes of helping with the air flow to the center of the pile. I think the holes may be too small, but I still got decent results for doing nothing but collecting scraps, adding wood chips, occasionally watering the pile, and waiting! I continued to add fruit and veggie scraps and brown leaf layers to the pile all winter long, right on top of the snow! I figured what froze would one day thaw and will all eventually go to the same place. 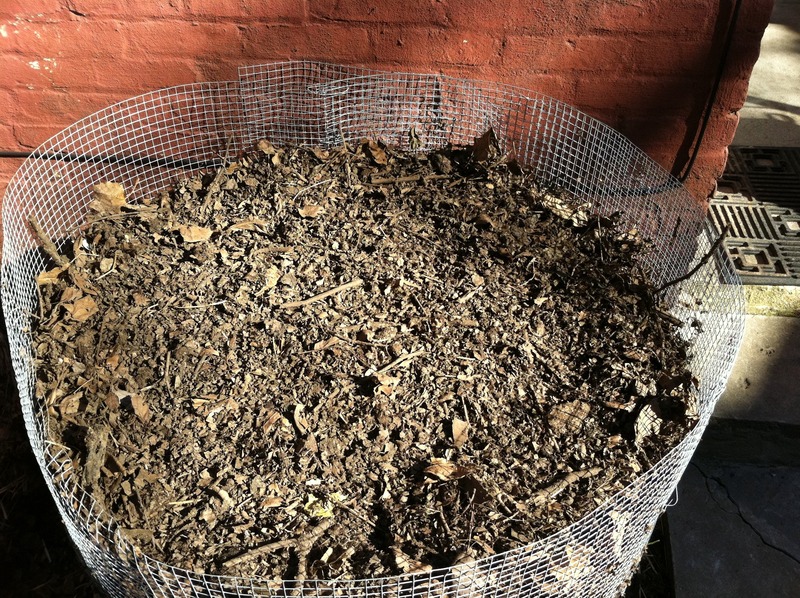 The whole thing was a new experiment for me – composting – and I wanted to see if I could get away with continuing to add stuff to the pile throughout winter. I’d say it’s looking pretty good considering 8 months ago that was lettuce and orange peels and tea bags! There were still a couple of avocado pits (will they ever break down?) and I found some random mystery plant with bulbs growing at the bottom of the pile, with no light and little oxygen! I planted it just to see what the heck comes up. I know it still needs to break down a bit more, but I think if I sifted it there is stuff here that can be used now and added to soil. Amazing!! It really is magical. 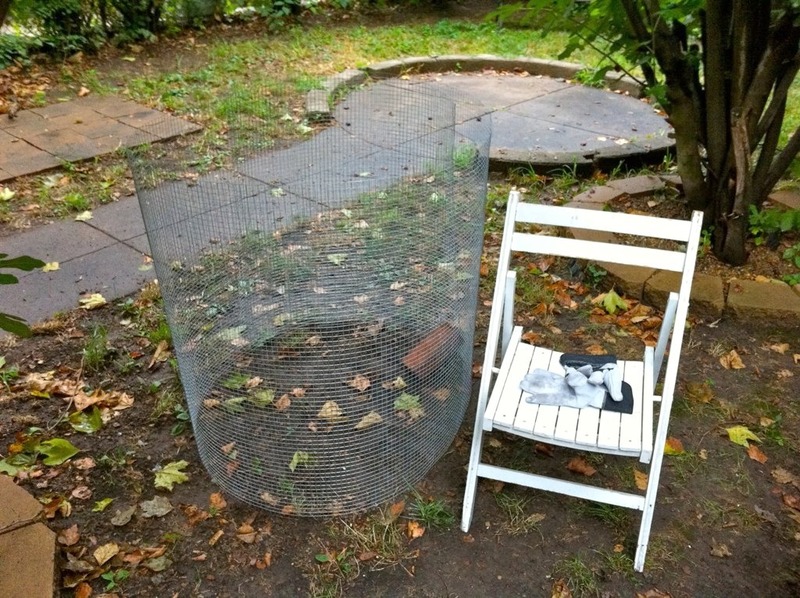 Can’t wait to get the original compost bin filled up again! I’m thinking I may need to make a 3rd bin now so that I will have another holding pen for mulch, now that this one has finishing compost in it. Good thing I have extra wire! The whole process has been really fun – making the bins, collecting the scraps, layering the pile, watching it grow, and seeing it turning into something else – something really useful that will save me money and help my plants. Not to mention all those scraps that won’t go into a landfill. I figure people could collect a week’s worth of scraps in a plastic bag in the freezer and that way it wouldn’t be a smelly, mushy mess…they could actually transport it. And maybe my compost pile would grow that much quicker. It would probably be much more practical to try and set something up with a local grocery store produce section or coffee shop for grounds…but I still like the idea of it (could you imagine the invitations?) 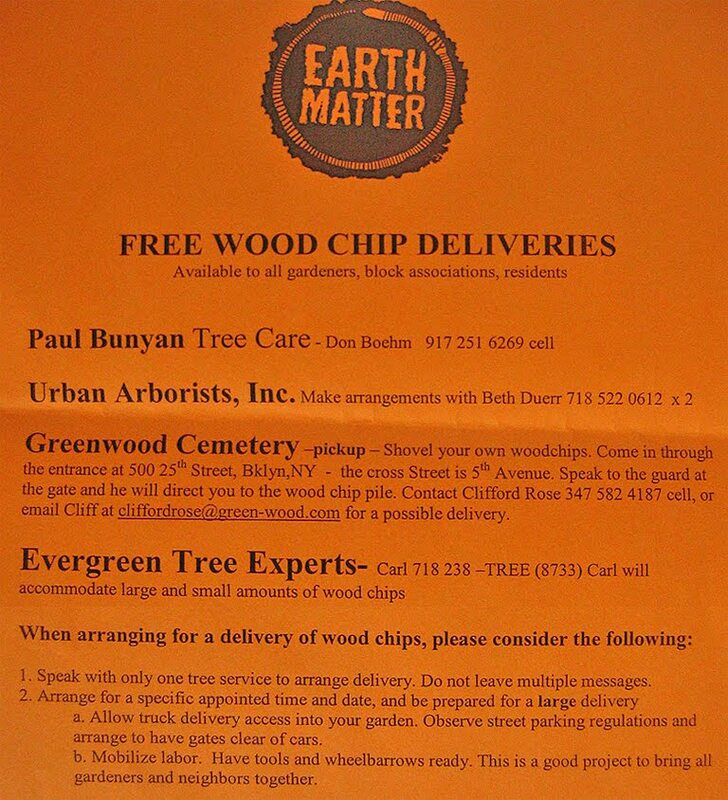 and maybe it would even turn some folks on to composting at home themselves. If you don’ t have a yard, there are always red worms!